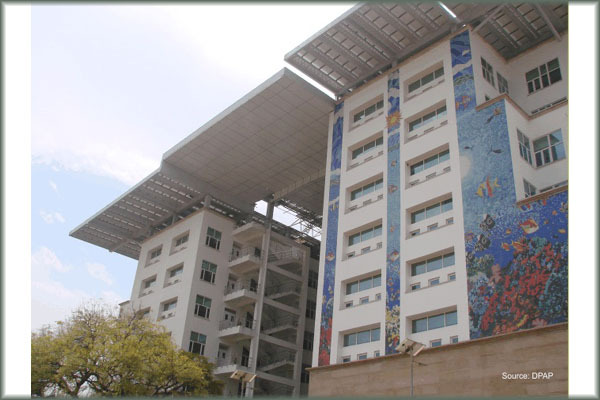 Indira Paryavaran Bhawan, the new office building for Ministry of Environment and Forest (MoEF) sets is a radical change from a conventional building design. 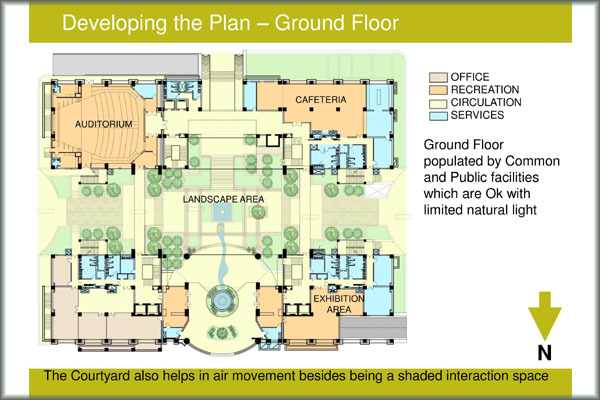 The project team put special emphasis on strategies for reducing energy demand by providing adequate natural light, shading, landscape to reduce ambient temperature, and energy efficient active building systems. Several energy conservation measures were adopted to reduce the energy loads of the building and the remaining demand was met by producing energy from on-site installed high efficiency solar panels to achieve net zero criteria. 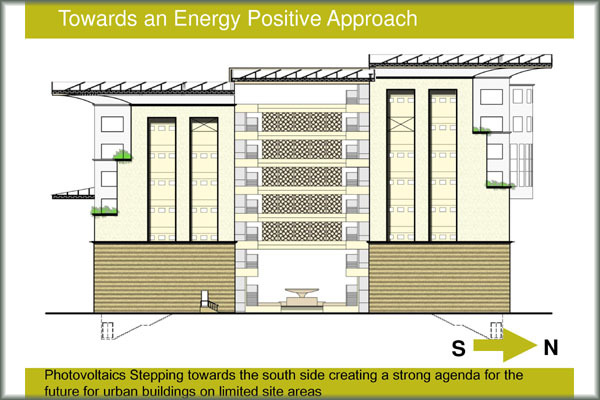 Indira Paryavaran Bhawan uses 70% less energy compared a conventional building. The project adopted green building concepts including conservation and optimization of water by recyclingwaste water from the site. Indira Paryavaran Bhawan is now India’s highest green rated building. 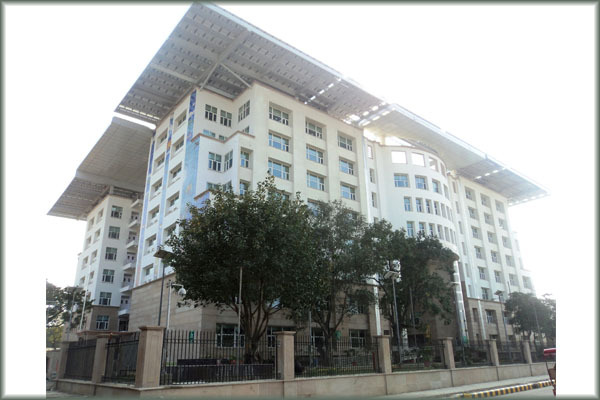 The project has received GRIHA 5 Star and LEED Platinum. The building has already won awards such as the Adarsh/GRIHA of MNRE for exemplary demonstration of Integration of Renewable Energy Technologies. Orientation: Building is north south oriented, with separate blocks connected through corridors and a huge central court yard. Orientation minimizes heat ingress. Optimal window to wall ratio. 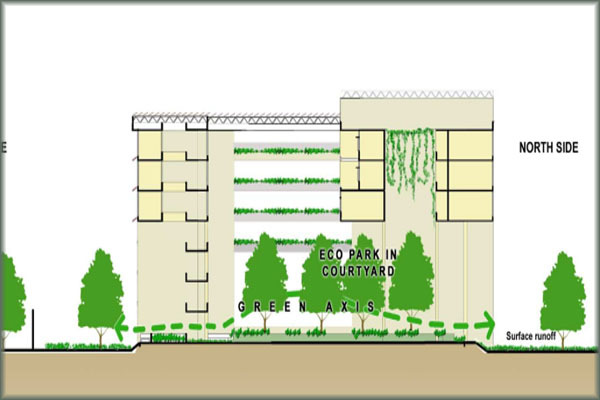 Landscaping: More than 50% area outside the building is covered with plantation.Circulation roads and pathways are soft paved to enable ground water recharge. 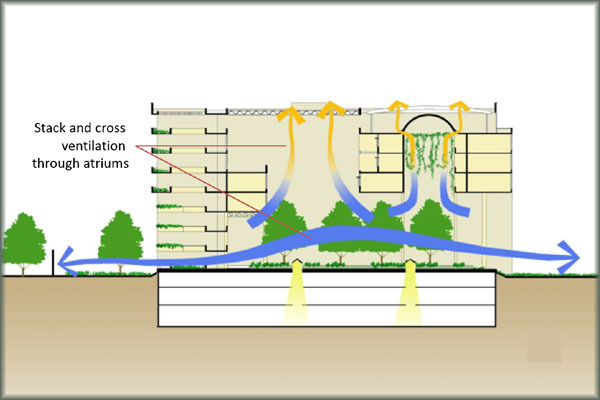 Daylighting: 75% of building floor space is day lit, thus reducing dependence on artificial sources for lighting. Inner courtyard serves as a light well. 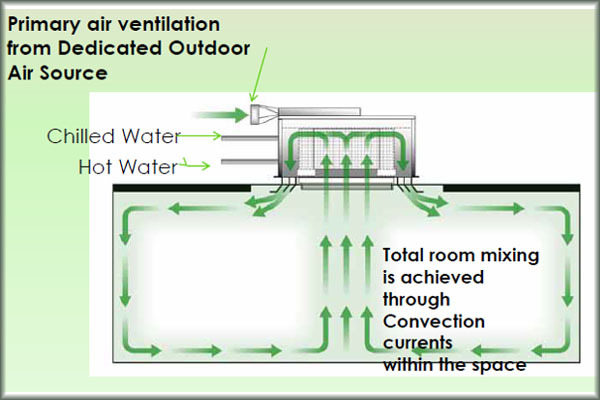 Ventilation: Central courtyard helps in air movement as natural ventilation happens due to stack effect. Windows and jaalis add to cross ventilation. Cool roofs: Use of high reflectance terrace tiles for heat ingress, high strength, hard wearing. Energy efficient lighting system ( LPD = 5 W/m2) , nearly 50% more efficient than Energy Conservation Building Code 2007 requirements ( LPD = 11 W/m2) reduces energy demand further. 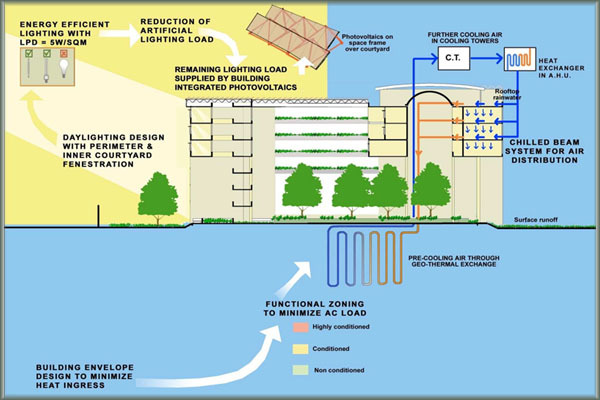 Remaining lighting load supplied by building integrated photovoltaic (BIPV). Use of energy efficient lighting fixtures (T5 lamps). Use of lux level sensor to optimize operation of artificial lighting. 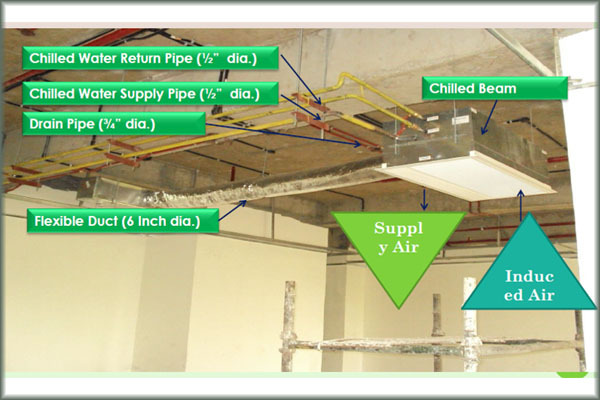 160 TR of air conditioning load of the building is met through Chilled beam system. Chilled beam are used from second to sixth floor. 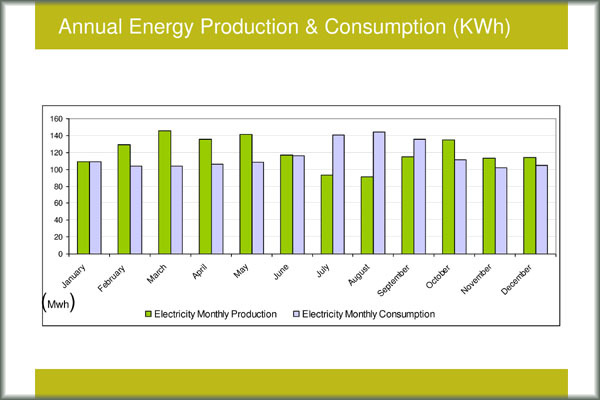 This reduces energy use by 50 % compared to a conventional system. Chilled water is supplied at 16° C and return temperature is 20° C.
Drain pans are provided with the chilled beams to drain out water droplets due to condensation during monsoon. Chilled beams save AHU/FCU fan power consumption by approximate 50 kW. VFDs provided in chilled water pumping system, cooling tower fans and AHUs. Fresh supply air is pre cooled from toilet exhaust air through sensible & latent heat energy recovery wheel. Control of HVAC equipment & monitoring of all systems through integrated building management system. Functional zoning to reduce air conditioning loads. There are 180 vertical bores to the depth of 80 meter all along the building premises. Minimum 3 meter distance is maintained between any two bores. Each bore has HDPE pipe U-loop (32mm outer diameter) and grouted with Bentonite Slurry. Each U-Loop is connected to the condenser water pipe system in the central air conditioning plant room. One U-Loop has 0.9 TR heat rejection capacity. Combined together, 160 TR of heat rejection is obtained without using a cooling tower.